Keep your jewelry safe and secure in this handy keeper that has three separate sections for different pieces and can be rolled up and tied for easy portability. 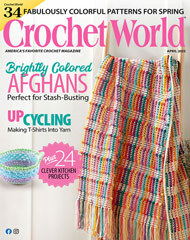 This e-pattern was originally published in Easy Living Crochet. Size: 13" x 7", unfolded. Made with medium (worsted) weight yarn and size G/6/4mm hook.